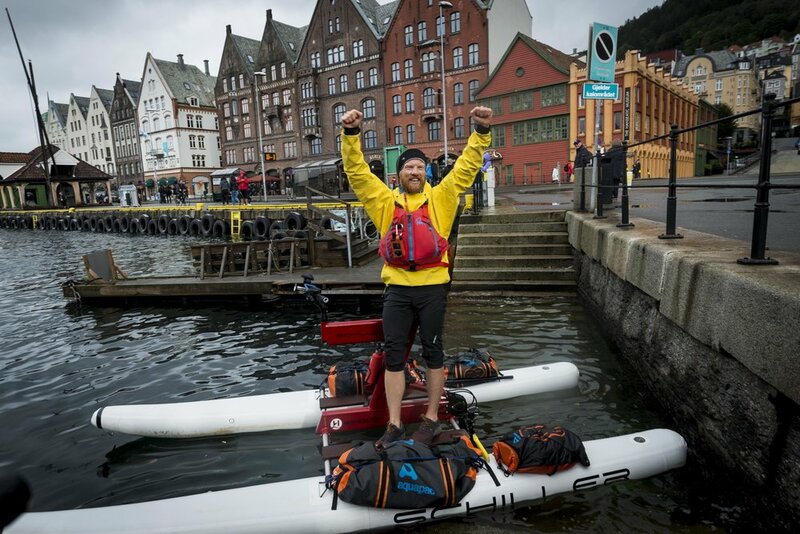 On the 3rd October I finally edged into Bergen after a 9 week journey from Kirkenes in Northern Norway. 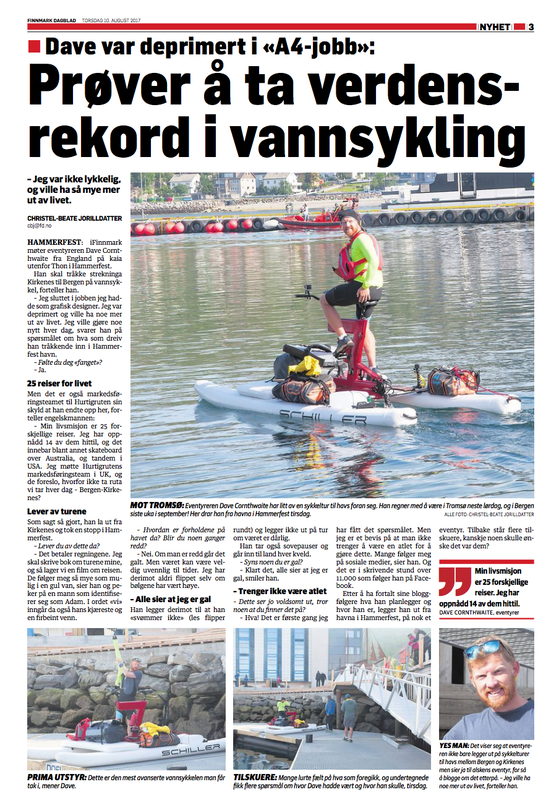 I pedalled 1243 mile/ 2090kms on a California-made Schiller Bike, breaking a world record for the longest distance by water bike. 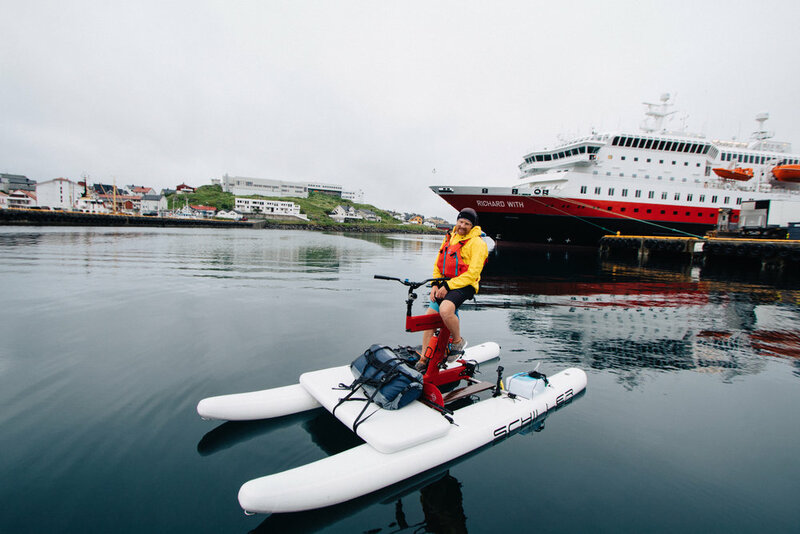 The journey followed a famous 124 year-old ferry and cargo journey known as Hurtigruten, or "The Express Route" and took in (what felt like every inch of) the Norwegian coast, dropping into fishing villages, remote beaches and wild stretches of untouched shoreline. 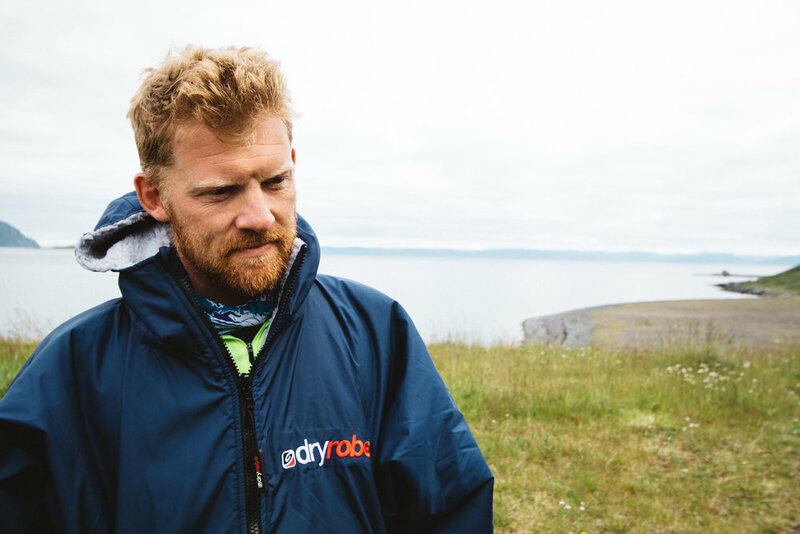 This was the 14th non-motorised journey over 1000 miles of Expedition1000, and arguably the most memorable. 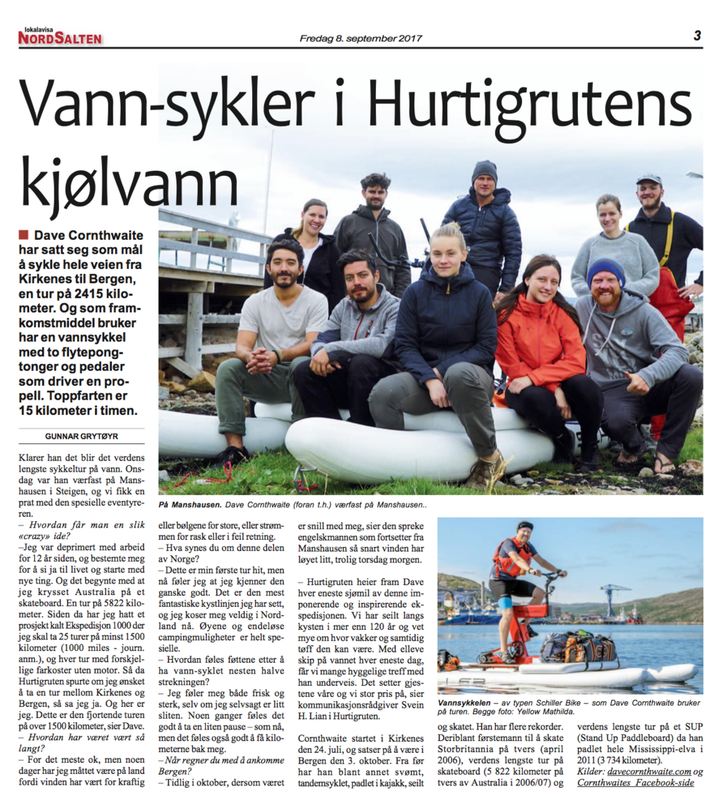 Hurtigruten ships stopped mid fjord with hundreds of passengers cheering us on, and they even served up a meal now and then. Along the way I experienced the true scale and beauty of Norway and its people, and it was a pleasure to share these experiences as a reminder that life can be so rich when acting on a decision, and that this world isn't a place to be feared. It's to be embraced. Stay tuned with Dave's daily video diaries, always posted first on Facebook with a hearty "Good morning!" 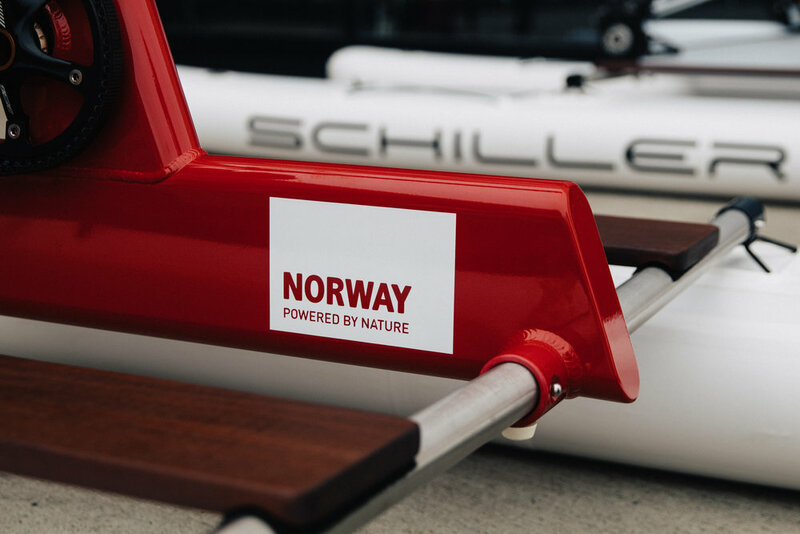 Created by Judah Schiller in California, the Schiller Bike is a unique mode of water transport. With average speeds of 5-6 miles per hour and a top speed of 10-11 mph this craft is eye-catching, well designed and the perfect way to attempt a brand new world record attempt. 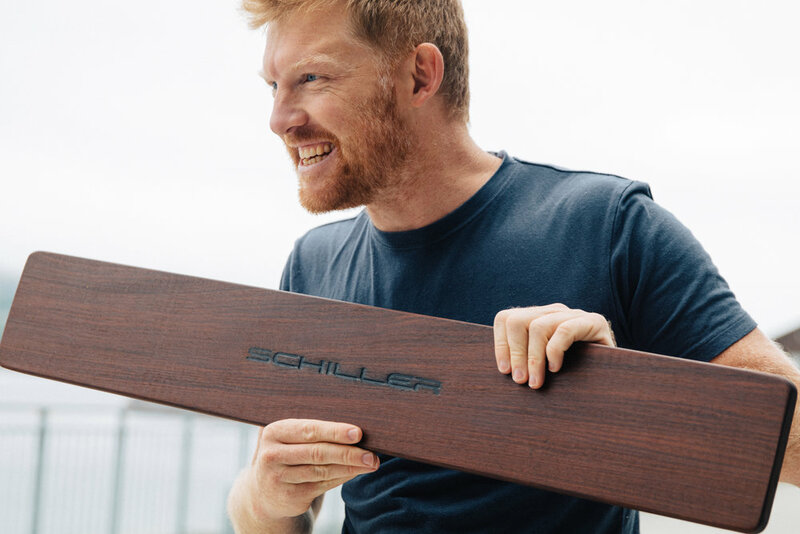 We'll be adding a custom platform between the pontoons to enable gear carrying, safe in the knowledge that the Schiller Bike can support 900lbs/ 400kg in weight (I won't be carrying that much!). Stories are our tools to pass down experiences and lessons through the ages. It's not important what you do, it's how and why, and I adore combining the struggles and joys of an endurance journey with the continued, honest narrative of an adventure. 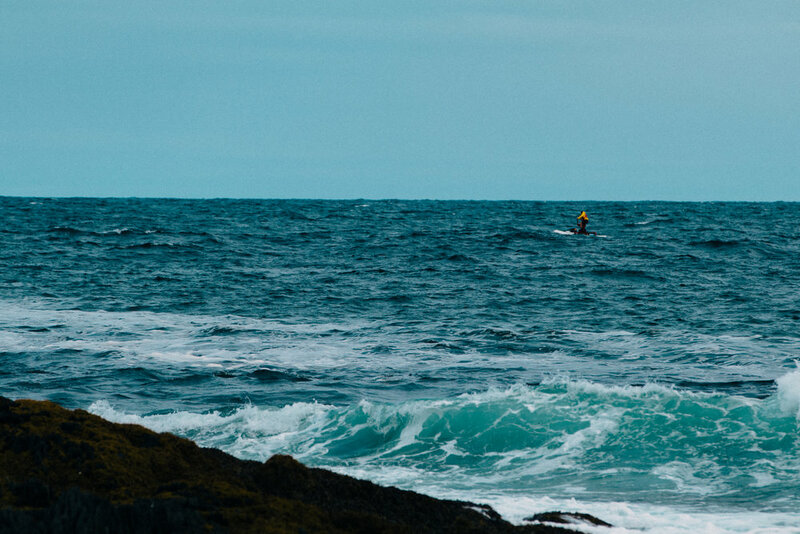 Norway's dramatic and ever-changing coastline is the perfect setting for a unique story. I'll often shoot solo, with the Schiller Bike set up with waterproof cameras and my trusty DSLR on hand for land-based filming and photos. A camera drone with tracking capability will allow me to capture the scale of the landscape, and I hope to be joined at points by photographer friends to grab those shots that I simply can't reach myself.